The following article appeared in the "Nordbayerischer Kurier" on 7/8 April 2001 and is presented here in English translation with the permission of the "Kurier". "Det J1" and "Reissmanns": former US soldiers, who were stationed on Schneeberg, are holding a reunion. "It was a good time with good people," remembers Jerry Davis, who was stationed on Schneeberg from 1966 to 1968. And for Robert S. Smith, who was on Schneeberg from 1985 to 1990, it was "the best place I've ever lived." Memories of these times will be rehashed at Easter when the ex-GIs meet in Bischofsgruen to make a pilgrimage to their old place of work on Northern Bavaria's highest mountain. The history of Schneeberg as a military observation and spy base goes back several centuries. As far back as medieval times observers kept watch on the surrounding area from the spot where the "Backoefele" stands today. When enemy troops were spotted, a signal fire was lit which could be seen from the "Hohe Warte" in Bayreuth - electricity-free military communications of the modern era. After the WW II it was US troops, and later the Bundeswehr, that 1990s. They eavesdropped on radio traffic, recorded it and forwarded it for analysis. In 1945 the US Army took control of the existing facility and added to it over the years. At the height of the Cold War up to 50 GIs under the command of a captain could be found working at an altitude of one kilometer. These were not your usual GIs. They were specialists with above-average educations and knowledge of East European languages. They were members of the Army Security Agency (ASA), an independent branch of the US Army. Their mission was to keep the armed forces informed about the potential enemy. The ASA, which was dissolved in 1977, had up to 30,000 members, who served in the USA, Berlin, Frankfurt, Bad Aibling, Turkey, Ethiopia, Japan and, of course, Viet Nam. "Basically we were the annual get-together of Schneeberg veterans at Easter. During the 1960s the base was called "Det J1", whereby Det stands for detachment (outpost). The main base was Herzogenaurach, later Augsburg. Up to 30 soldiers were permanently quartered on Schneeberg on the spot where the Mountain Rescue cabin stands today. It was a life under extreme conditions. "I remember snowflakes on August 29th," writes Joe Deegan (on Schneeberg 1969/70) in the guest book of a Internet site created by one of the veterans. It is a very entertaining and informative Website (see info box), which contains texts and numerous pictures from the 1960s. Many of the pictures were taken in Tanzcafé Reissmann. Because "Reissmanns", which has been in its current location since 1965, was the center of nightlife off the mountain for the Americans. Memories include the old tunes played back then, the many girls from Bischofsgruen, and the hearty "Gulaschsuppe", served after at the end of long nights of beer, schnapps and Jaegermeister. The DJ back then was current town councilman Gunther Zeissler. Between 1970 and 1974 the US compound was vacant. During the late 1970s and 1980s it was again occupied by a small number of soldiers. During this period there was a double agent on Schneeberg: James H. requested a transfer from Bischofsgruen to Berlin, where he sold military secrets to East Germany. His contacts were Turks. Because H. kept company with Turks during his stay in Bischofsgruen, it is possible that he was recruited as an East German spy while in Bischofsgruen. But H. will not be at the reunion. He was caught, convicted and is now serving a 40-year sentence in the USA. The base was finally abandoned during Operation Desert Storm. The last American left Schneeberg around 1992. Since then the compound has been unoccupied. The only things that remain are a few antenna towers and the main building, which was built before the war and underwent extensive renovation during the 1980s. The vacant building is quite musty, and the plaster is falling from the ceiling. The future of the building and surrounding plot is uncertain. (Caption to "unknownlocalsgi3.jpg" from Ken Pelfrey's Scrapbook) Anyone recognize him or herself in this picture? German-American nightlife in Tanzcafé Reissmann around 1965/66. Reissmanns was the favorite haunt of the GIs. Here, they listened to the latest dance hits instead of Czech radio traffic and mingled with the German Fraeuleins instead of captains and sergeants. Pelfrey photo. 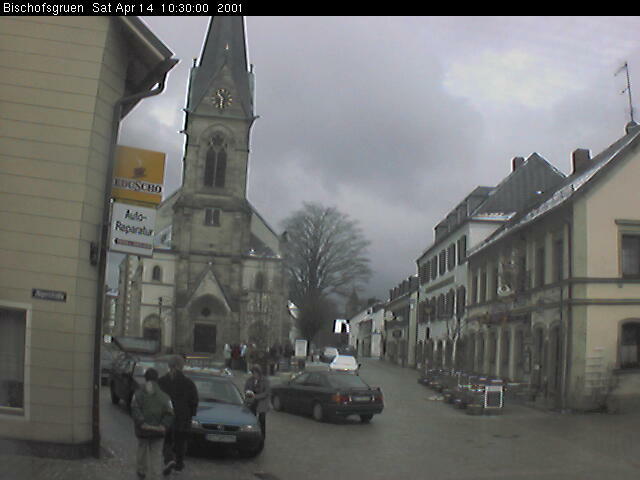 I just returned from Bischofsgruen where we enjoyed another successful Easter reunion despite the cold weather. Here is my official report. This year a total of 16 hikers gathered in front of the church around 10a.m. for the pilgrimage to the top of the Hill. The group included two journalists from the "Nordbayerischer Kurier" Andreas Gewinner and PeterEngelbrecht, Gunther Zeissler, Dave Fenwick with wife Nancy and friend Ernie Smith, Juergen Schindler and wife Schu, Fritz Foltz, Elisabeth Brundage, Uwe Mendisch, Heidi Pike-Treute, Sam & Rosie Hays, and Ed &Teresa Railsback. After being officially greeted by the Burgermeister of Bischofsgruen we drove to the "Schlagbaum" above the "Krankenhaus" and setout on foot on the snow-covered road. The hike began with light snow flurries but half-way up the Hill we found ourselves in the middle of a mild blizzard. Fortunately the storm subsided somewhat by the time we reached the summit and we were able to take some good pictures. A section of the fence around the compound had been blown down by recent storms and we were able to walk right up to the former ops building and peer into the windows. The building is totally empty. A couple of us remembered to bring our binoculars this year, but they proved to be totally worthless. Maximum visibility was roughly 100 meters. After taking numerous photos we sought shelter from the snow at the "Bergwachthuette", the mountain rescue cabin built on the site where the mess hall once stood. From there we called our former commander Larry Medlin via cell phone, but the quality of the connection left a lot to be desired - no doubt due to the adverse weather. When we returned from the hike we retired to the "Landgasthof Benker" for lunch and a long afternoon of rehashed memories. There we were joined by John & Renate Flood, Ken & Irene Knorr, Hertha Stelzel and Ty Pinney. As the youngest Schneeberger present, Ty bought a round of drinks for everyone. We're all looking forward to seeing Ty at our next get-together! The press coverage we received before the event also attracted some local residents from the surrounding area who were in search of information about former friends. I have already set the wheels in motion to find these people. 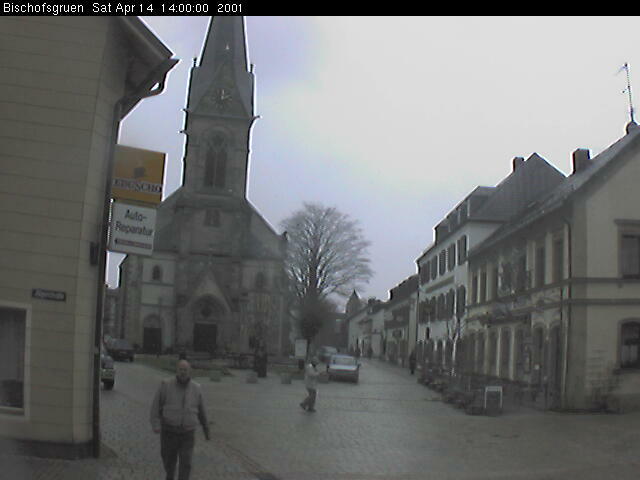 Due to the cold weather it was difficult to find anyone willing to go outside and stand in front of the webcam focused on the Marktplatz. Unknown to us Phil Ward was poised at his computer back in Kansas ready to save any and all webcam photos of the "usual suspects." He managed to save two: at 2 p.m. Dave Fenwick and his friend Ernie were caught walking down the street. When the last group emerged from the Benker just before 7 p.m. we found a bunch of well-lubricated (by their own admission) Berlin tourists standing in front of the church in hope of being caught by the webcam at the appointed time. We joined them. The photo saved by Phil (sat1900.jpg) is attached. Phil will post both the 7 p.m. and the 2 p.m. photos on his website soon. Unfortunately, the photo is so dark that it is impossible to recognize anyone. The Berlin tourists are in the back row. In the foreground are: Elisabeth Brundage, Heidi Pike-Treute, Hertha Stelzel, Gunter Zeissler, Sam & Rosie Hays, Ed & Teresa Railsback. Take my word for it. Next time we'll stand closer to the camera. For those of us living in Germany the four-day Easter weekend has always been a convenient time to meet in Bischofsgruen. But several people back in the states have told me that Easter is a time when they get together with their families and is thus not a convenient time to make the trip across the Big Pond. And we all know that April weather is very fickle: one day it's warm and sunny, the next day it's rainy, snowy, windy, foggy, etc. Summer is not a good time for residents of Germany, because many of us are on vacation in other parts of the world. Gunter suggested that October would be an ideal time for our get-together. Fall weather in Germany is generally pleasant and the tourists are gone. Accommodations in Bischofsgruen and airfare to Europe are also cheaper at that time of year. How does an October reunion sound to those in the USA? We German residents will probably still continue to get together in Bischofsgruen at Easter, but many of us would have nothing against making two treks up the Hill every year. At the reunion I presented 2 CDs with all the familiar tunes spun b yGunther in Tanzcafe Reissmann from 1964 to 1969, and I have plans to complete the 60s set with a third CD featuring hits from 1960 to 63. I found a complete list of all the German hits from the 60s on the Internet, and downloading the tunes via Napster was easy work. These are not songs that appear on the record industry's list of "copyright protected recordings." I will make the CDs available to everyone out there in cyberspace very soon at cost plus postage. Look for an e-mail from me in the very near future. The CDs provided the background music for our get-together in the Benker. PHOTOS, PHOTOS, PHOTOS Dave Fenwick, Sam Hays and Fred Foltz dug into old shoe boxes and came up with some more interesting photos from the 60s. I will scan, caption and forward them to Phil ASAP. Andreas Gewinner was also kind enough to make available to us a large stack of Schneeberg photos on file at the Nordbayerischer Kurier including the overhead shot that ran with the article. I will also scan these photos and forward them to Phil. Several Bischofsgruen residents were able to identify the girl in the photo that accompanied the Schneeberg article in the Nordbayerischer Kurier. The attractive woman in the photo ("unknownlocalsgi.jpg" under KenPelfrey's Scrapbook, Reissmann's Tanzcafe) is Helga Zeitler, who now lives near Braunschweig. What do you think is this the Reunion 2001Gang????? Next year they have to get closer to the camera ....... Ed confirmed this (19:30) is them and a few drunk Berliners in back of them. The 14:00 hours picture is of Dave Fenwick with his friend Ernie walking across the street. Next year we'll get better pictures. Scroll down for the translation. On Saturday Northern Bavaria’s highest mountain was the destination of an unusual hike amidst snow flurries in below-freezing weather. 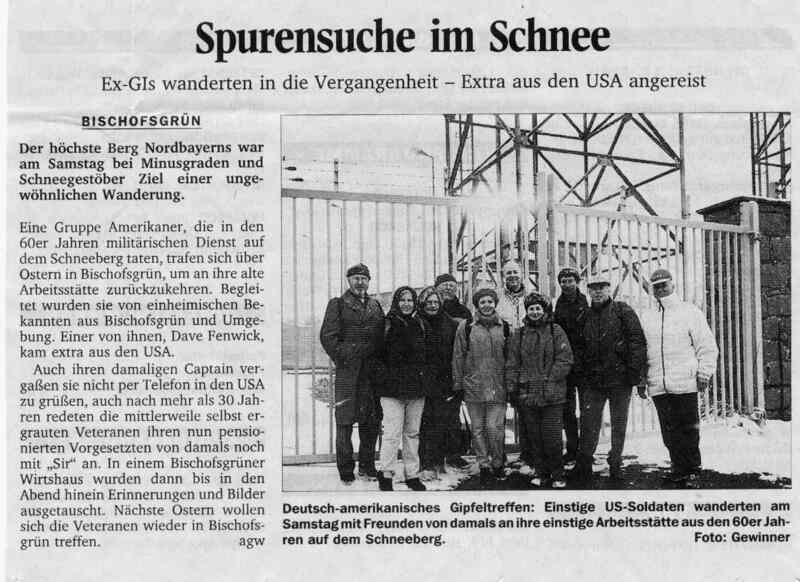 A group of Americans, who served in the military on Schneeberg during the 60s, got together again at Easter in Bischofsgrün to return to the place they once worked. They were accompanied by friends and acquaintances from Bischofsgrün and the surrounding area. One of them, Dave Fenwick, traveled all the way from the USA for the occasion. The also called their former captain in the USA via cell phone to say hello. And even after more than 30 years the now graying veterans still addressed their now retired superior with "sir." Afterward they exchanged memories and photos until the evening hours in a Bischofsgrün Gasthaus. The veterans plan to meet again next Easter.